LinkedIn Messaging launched + Featured in the Jamaica Gleaner! It's been an exciting month - and it still seems weird to see my face and name so large! First, a project that really felt like my baby last year launched on mobile and desktop - a completely revamped LinkedIn Messaging experience. As the lead on iOS last winter, I learned so much on this project - and the team was really passionate about bringing the best experience to our users! My highlight reel would consist of architecting and implementing a threaded messaging system while taking into consideration issues on mobile like notifications, real time, pagination, caching, message failures and retrying logic. I worked with so many smart people on this, the many articles raving about the new experience are just the icing on the cake. Second, and related to the first, I recently got contacted by Robert Lalah of the Jamaica Gleaner. For reference, the Jamaica Gleaner is a 180 year old newspaper in my home country of Jamaica, and its Sunday Gleaner commands 77.3% of Jamaican readership. 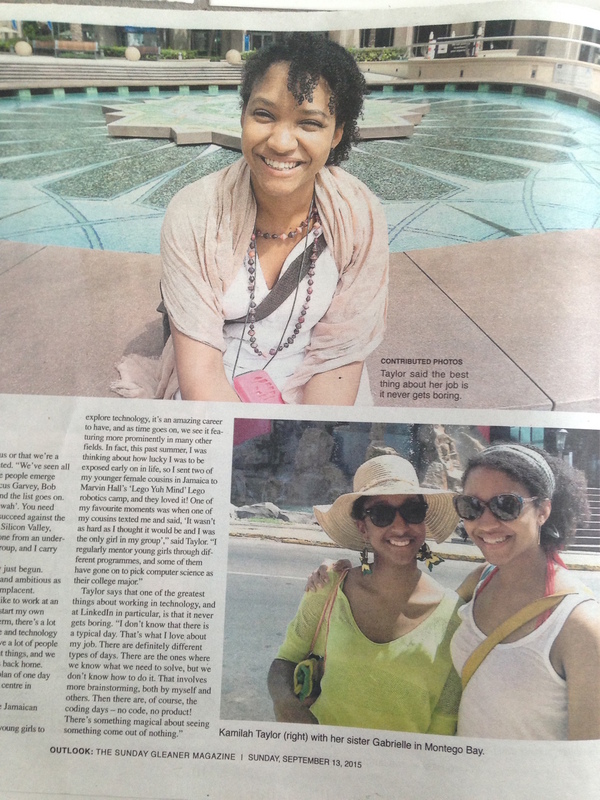 So when Lalah reached out to me and asked about featuring me, I said yes - not realizing that they'd do a 3 page spread in the Sunday Gleaner! I especially loved the questions, as it gave me a chance to talk about things that I'm passionate about - getting more women in STEM, more underrepresented minorities in STEM, and more opportunities for STEM fields in Jamaica. Since the article has come out, I've heard so many stories, both first hand and second hand, of people reading it to their daughters, of girls feeling inspired, of some of my own Jamaican peers feeling inspired, that I can't help but feel humbled and lucky to have gotten this platform. One last note - I'm speaking at Grace Hopper next month! Very excited to be on this stellar panel talking about building and testing accessible iOS apps, one of my side passion projects. If you're one of the 10,000 women (!!) attending, swing by our panel or say hi at the conference. Will share the experience in a future post! Last Sunday, I stumbled upon this gem of an old pic. HAL, My Intensity Bug Robot. Yes, her name comes from 2001: A Space Odyssey, not because she was evil, but because she's from UIUC! Background: In 2008, my advisor (Steve LaValle) assigned Bug algorithms (a category of planning algorithms) as my weekly reading. I identified what I thought was an oversight. These were supposed to be super simple, just a point robot magically navigating to some end location, only equipped with a touch sensor so that it could circumnavigate obstacles. Turned out, it needed much more than that - gps, compass, enough processing power to calculate slopes on the fly. So I decided to start with a robot that actually only had a touch sensor, and see how I could add a minimal set of sensors and have it reach its goal. I can't remember how I came up with the idea of having the end location be a tower emitting a signal, but I do remember that this insight, combined with the subsequent insights of the exact pieces of information the robot would need, was the highlight of my grad school career. I still had doubts that this would work in the real world, and it took me a while to find a signal that exhibited the properties I'd written about. The first time HAL successfully made it to the "tower", i.e. the infrared beacon source, was perhaps the second highlight. I probably should have kept around a video of me cheering!